QNP specializes in the research and development of Generators from 0.5MW to 200MW, and can meet the needs of our customers and provide them with efficient and reliable generators. Currently, the excitation system of generator can be divided into brush excitation system and brushless excitation system. Each system has its own advantages and disadvantages. The following is a brief introduction for customers to use as reference when selecting equipment. Static silicon controlled excitation system uses the excitation transformer of the generator end to perform fully-controlled bridge rectification, so as to obtain the required direct current, which is then applied to the rotor coil of the generator through brushes and slip rings to generate magnetic field to cut stator coils. The advantage of the brush excitation is that there is a distinctive boundary between the generator and the excitation system, both parts are relatively independent, can be directly and clearly perceived, and the rotor excitation current and excitation voltage are easy to get, the numerical value is accurate, and the overhaul is convenient. It`s disadvantage is, due to the presence of the brush, the contact resistance is increased, and with the increase of the excitation current, the brush and the slip ring often emit heat due to poor contact. In severe cases, an annular fire might cause the brush holder and the slip ring burned. And the quality of the brush also directly affects the stability of the operation. In addition, the carbon powder produced by the brush during wear will have certain impact on the environment, and will easily contaminate the #4 bearing seat, and thereby reduce its insulation performance, and cause potential troubles for safe operation. Because the brush is easily worn out, the operating personnel should often check and replace the brush. The excitation system of this type of unit consists of a generator and with which an excitation generator coaxially connected. This kind of excitation generator is different from the DC generator that is coaxial with the generator. This kind of excitation generator is essentially an alternator. The three-phase AC generated by it is rectified by a rotating rectifier connected to its shaft. The output direct current is directly connected to the rotor windings to generate the rotor magnetic field. This system also has two-unit type and three-unit type. The advantage of brushless excitation system is that without the brush, there are no problems of poor contact and the resulting heat problems, and no electric spark is generated so the device won`t be burned. Without the brush, there is no worn-out carbon powder, and the two ends of the generator are very clean, and there is no need to replace the brushes and the maintenance is easy. Its disadvantage is that the DC output from the excitation generator is directly connected to the rotor winding, so it is difficult to directly measure the actual current of the rotor, and the rotor current is often calculated according to the rotor voltage and other related parameters, but there is a certain deviation. If the rotating rectifier fails, it will not only be difficult to maintain (it must be shut down for maintenance), but also threaten the normal operation of the unit. Looking for ideal Steam Turbine Electric Generator Manufacturer & supplier ? We have a wide selection at great prices to help you get creative. All the Modern Steam Engine Generator are quality guaranteed. 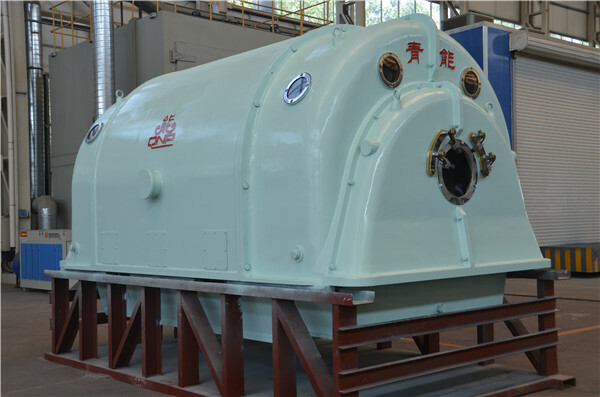 We are China Origin Factory of Steam Powered GeneratorS. If you have any question, please feel free to contact us.